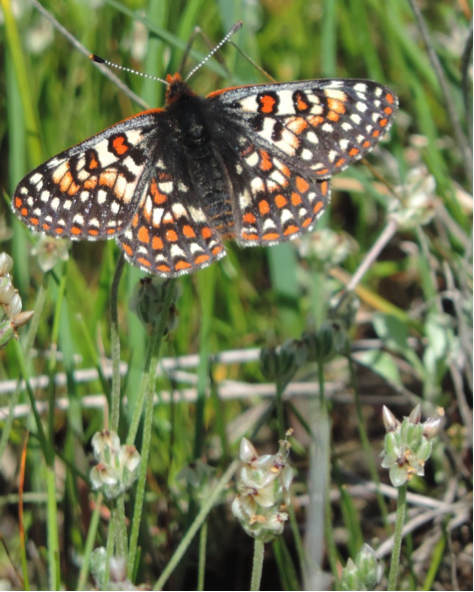 An ongoing priority for the San Mateo County Parks Foundation is to re-establish the federally-listed Bay Checkerspot butterfly at Edgewood Park and Natural Preserve. This butterfly is found in rare serpentine soils in only two counties in California. Since 2007, the Parks Foundation has been working with a team of scientists, volunteers and partners to restore native plant habitat and re-introduce the butterfly to its former home. On the edge of survival: the presence of the threatened Bay Checkerspot butterfly is one of the reasons Edgewood Park became a natural preserve instead of a golf course! Checkerspot caterpillars eat California plantain and owl’s clover, while adult butterflies sip nectar from wildflowers like goldfields and tidy tips — all native plants found at Edgewood. However, invasive, non-native plants are crowding out the plants the butterflies depend on. Habitat restoration efforts include well-timed mowing of annual grasses and fall dethatching to reduce grass cover and increase host and nectar source plants. Volunteer Weed Warriors help through hand pulling and other labor intensive work, drastically reducing grassland weeds such as yellow starthistle, Italian thistle and teasel and preventing establishment of new invaders like stinkwort and Mexican feather grass.